MOUNT DORA _ Crews are scheduled at night December 3-7 to close State Road (S.R.) 46 at U.S. 441 to install beams for the new flyover bridge. Traffic will be detoured via Wolf Branch Road and Round Lake Road as noted on the map below. The work will occur nightly from 8:30 p.m. – 6 a.m.
S.R. 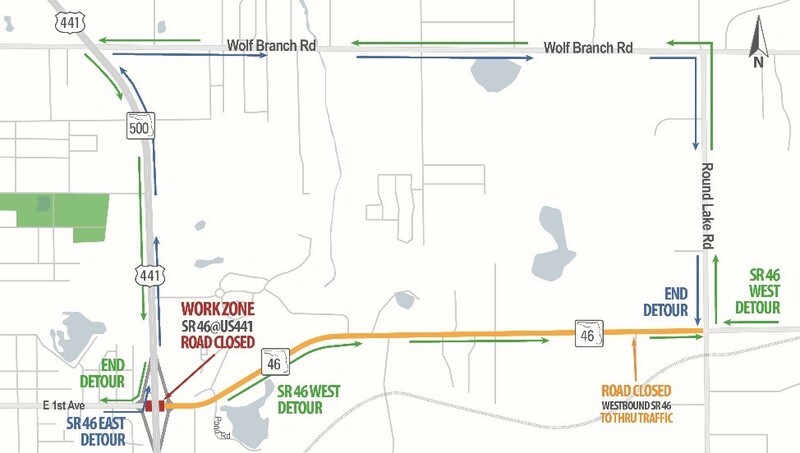 46 between Round Lake Road and U.S. 441 at night will be open to local traffic only. Electronic message boards are in place and law enforcement officers will be on site to help direct drivers. Please note this schedule may change due to weather or other unexpected conditions. This activity is part of Wekiva Parkway Sections 3A & 3B, which began in October of 2017. Work is scheduled to finish in spring of 2020. This 3-mile stretch of non-tolled road improvements includes widening S.R. 46 and U.S. 441 to six lanes, sidewalks and other pedestrian improvements, and building a flyover ramp for the heavy traffic that will be trying to get to the parkway.